Indie games are on the rise. Only past August, I reported on the first dedicated video games convention in the New York area, PLAY NYC, which put a strong focus on indie games and was a tremendous success. Yet, indie studios are still struggling. In many instances, they have to rely on support in the form of grants from government programs. All the while, a different branch of the video game industry is developing rapidly — if not explosively [EN: Ha]. Esports attracts ever-growing crowds of players and spectators, and it’s generating fantastic sums of money. Would it maybe offer a chance for indie developers who could carve out a niche in this emerging industry of esports? And, if indie developers do decide to cater to that market, how does a game have to be to be ready to be taken on by esports? 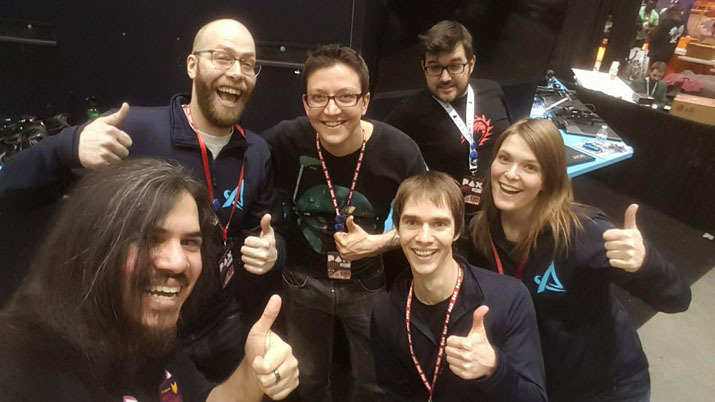 Carrying these questions with me, I was able to speak to the Canadian studio Chainsawesome Games, who are working on the first-person action shooter Aftercharge. They were glad to tell me about their studio, located in Quebec City, how they conceived their game with esports in mind, and what they expect from the open test phase on Oct 13 to 15. Tell us about Chainsawesome Games. When was the studio founded and what were your experiences in producing games? The studio itself was established in 2012 by three people — two programmers and one artist — who had gained experience working in different studios before, but mostly with one studio (that is) in Quebec City, which is called Frima Studio. They decided to try it on their own and began working on a project which was later canceled because it had been too ambitious. Their first successful project was BeatBlasters III which is a game they released on PC. It’s a rhythm game with platformer and puzzle elements — a unique take on those genres. It didn’t perform very well, like most first games of a studio. They didn't invest much in marketing. How is Quebec City as a location for indie developers? Are there certain advantages or disadvantages you noticed? I don’t see many drawbacks in Quebec City (or) the province of Quebec, in general. It’s a great place to start a studio. There are some government incentives, there's a tax credit we can get for making multimedia titles... video games fall under (the multimedia) category. We can also try and get a grant from the Canada Media Fund which we received for Aftercharge. The grant can be quite a large amount. They fund seventy-five percent of production. On top of that, in Quebec City, there is the Pixel Challenge [...]. It's getting bigger each year. Quebec City is a great city to try your hand at something new and maybe create a prototype that will become a commercial title later on. On top of that, it’s also beautiful. I see absolutely no disadvantage in working on indie games in Quebec City as compared to other locations. You received a grant to work on Aftercharge. When we talked before, you mentioned that there are conditions tied to this grant. Could you elaborate on those? Yes, of course. The first condition to be allowed to get a grant is that you own the intellectual property of that game. [...] It has to be an original Canadian idea of your studio. Then, when you get the grant, the [Canada Media Fund is] entitled to 50 percent of the revenue until they recuperate their investment. If [that happens] in the first two years, it goes down to 25 percent. There is also another twist which we try to take advantage of: when you create games, and you keep reinvesting into the same project, the percentage you owed to the Canada Media Fund goes down to 12.5 percent, because you keep reinvesting. [...] we plan on doing [that] with Aftercharge. We’ll try to keep investing and add so more characters, maps, and more content to give to players. We will reinvest probably everything in that. You guys won a lot of awards — which were those, and what importance do they have in keeping developing games? The first very important one [...] was the first game jam, the Pixel Challenge. That was back in 2013. It was $5,000. The amount itself was more of a [...] validation. Then, the second one was another contest particular to Quebec City which is called Catapult. Industry experts supervise it, who look at your game and your business model for it. You have to pitch in front of a jury, and if you win, which was the case for Chainsawesome’s Knight Squad, you get $50,000 and they help you with some coaching to make sure the game performs. With that amount the team invested in marketing, getting into shows, getting the game out there, and showing it to people. That was pretty much the starting point of how the studio got their support from Microsoft, because Knight Squad launched as a Games with Gold game. It was given away for free for the first month, which comes with a big, fat check. That probably [happened] because of Catapult. Before we talk about esports and Aftercharge, could you quickly describe the game? Aftercharge is a 3v3, competitive game in which one team is invisible, and the other team is invincible. It pits invisible robots against their creators in fast-paced skirmishes. The games usually last five minutes and the goal of the robots is to destroy the six extractors on the map. The opposing team, of course, has to stop them. What effect does it have on the game design when you have the possibility of esports in mind? For one, the most important thing is that the game is balanced. We put a challenge there for ourselves, because the concept itself is asymmetrical. There are a lot of things to balance. We want the game to have a perfect balance. It has to be fair; every character has to have its role, not being completely useless, (but) not overpowered, either. That’s the first thing we keep in mind. But also, a crucial thing about the esports scene and competitive games is that it has to be entertaining. It has to be pleasant to look at and enjoyable to watch. We need to keep in mind what the spectators will see and how exciting that is going to be for the esports scene or on Twitch, where influencers stream the game so people can see it in action. We have a game that is exciting to watch because there's a lot of strategizing involved. There are skills involved, but it's mostly strategy in the sense that your coordination as a team is what’s going to give you victory--more so than your skill at shooting. In the most popular competitive games, strategy and teamwork are always central. These two things are very central to our game design. Another nice little thing that we thought of after starting to work on the game is that as a spectator it’s fun to have more information than the players that are playing. For example, when you spectate Aftercharge, and you see the whole battlefield, you have more information than the enforcer team, who does not know from where the robots are coming. You have an edge on them, and it’s exciting because you want to know how it unfolds. How does Aftercharge set itself apart from other battle arena FPSs? What makes it unique? [It sets itself apart] in many ways, mostly the mechanics. 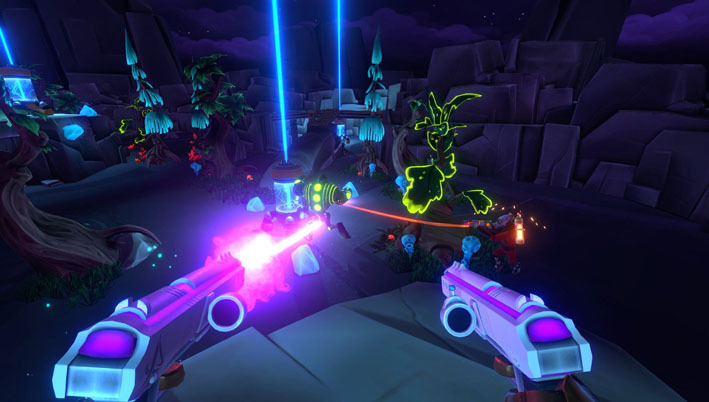 When you look at some footage of Aftercharge, you say, “Oh, it looks like a team shooter with nice neon-versus-dark lighting,” but it’s much more than that. One thing is, of course, the almost permanent invisibility of one of the teams. The game plays more like a cat-and-mouse game than a confrontation. That sets our game apart: the stealth is key. When you play the robots, you don’t want to confront directly; you want to sneak around and create distractions. But that's only one of the mechanics that are unique. On the robot side, the robots can revive themselves indefinitely. So, we do not have respawn mechanics. For the robots, the only way to get back to the fight is to be revived by their teammates, which happens a lot because it does not cost anything; it’s instantaneous and there's no cooldown. You can revive your allies and your life as a robot is dispensable. You can always use it as a tool to deflect the attention of the guards. Your life is worth nothing because you can be revived at any given moment, so it’s not a big risk. You can say, ‘Hey guys, look, I’m here, shoot at me,’ while your teammates are destroying Extractors. On the guard side, they do look and feel more like a regular FPS, but we added a couple of mechanics that are really out there. For example, the whole energy management. [The guards] don’t have ammo, they have energy. The way they can recharge their energy is to stand close to extractors. Those nodes of energy on the map serve both sides. They’re the primary objectives for the robots and they’re also the only way for the guards to regain energy. This energy is what they use to shoot and fuel their special abilities. That sets the game apart, but there [are] a couple more [unique aspects] still. We bring mechanics that are really out there. Tell us about the open test phase on October 13 to 15. What are you expecting to learn from it? We’re looking to get some player feedback on the mechanics, on the visuals, on [basically] anything. We have shown the game at a couple of events before. We showed it to a lot of people individually, but we never got mass feedback. We’re excited to see what it’s going to look like. We’re pretty confident that our game is amazing and we’ll see what other people are thinking. We still have a lot of time in development — six or seven months, since we’re planning on releasing in Spring 2018. So, we’ll have time to take this feedback in and act on it if we feel like it contributes something interesting. To whom do you distribute keys? That’s the thing. We don’t know exactly how we’ll go about it. We’re talking to our contact at Steam at the moment. It's looking good that we might be just entirely open. Since it’s going to be only one weekend, we’ll probably be running as what is called an open beta. We’ll try and title it an open alpha to make sure that people know that's it's not beta, yet. That would be the easiest way to go about it — [easier] than to distribute keys. It’s still unsure, we don’t know exactly which path we’ll take, but there’s a ninety percent chance (that) it’s going to be open to everybody for the weekend of the 13th, 14th, and 15th of October. How important is Twitch or other streaming platforms for your marketing? Streaming, in general, will be very important. At the moment, we have done none of it, since we preferred having sessions behind closed doors with press and publishers, but we absolutely want Twitchers, and even YouTubers, to play our game. They are a part of our strategy, and it starts with our open test phase in October. We wish for the game to be streamed and we definitely encourage people to do so. Form the first open test phase on we want people playing live as much as possible. The way to show the game [having] an esports [potential] is to have it spectated. Twitch is perfect for that. It’s going to be very important. We don’t have a lot of experience in influencer marketing and getting in touch with influencers on Twitch, but we’ll try our best. To which demographics do you expect Aftercharge to appeal, and are there countries where you expect the game to be especially popular? Regarding countries, well, we know that Xbox is very strong in the U.S. in general, and we have them as a big partner in terms of marketing help. I think we’ll do well in the U.S. and in North America in general. Regarding the rest of the world, I have to say, I don’t know really. I’m aware that some countries are more and less (attracted to) FPS, for example, I think, Japan [is less fond of them]. Merci beaucoup, Chainsawesome Games, for the interview. We look forward to playing the “open alpha” on October 13.